When I was a junior in high school, our English teacher, Mr. Paul Hagedorn, gave what seemed like a daunting assignment: Compile a personal poetry notebook of what seemed like an outrageous number of poems we liked, and pick one poet from a prescribed list, and write a term paper on our selection. I didn’t recognize many names on Mr. Hagedorn’s list. He seemed intent on moving us past the old classic American poets that our parents had loved and to introduce us to modern poets. I panicked. I already instinctively knew that picking the wrong poet could prove to be deadly. I was going to have to get to know everything about the poet I selected. Read his works and live with him until the term paper assignment was complete. Nothing worse than being forced to spend time with a boring or impenetrable poet! So I did the sensible thing. I chose the poet with the most interesting name: John Crowe Ransom. You must admit. That’s a great name. I got lucky. 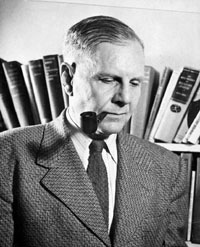 John Crowe Ransom proved to be a poet I could read, understand and appreciate. I learned a few new words, but I didn’t have to translate every other word into everyday English. People love “Bells for John Whiteside’s Daughter.” I do, too. But Ransom’s poem that really knocks me out is “Winter Remembered.” It’s about love and loss. A common tale, but told so well. If you’ve got a minute, read the whole thing. (It’s pretty short. Just five stanzas.) I’ll quote the last stanza here. That image of the frozen fingers as frozen parsnips is worth the price of admission. Ten frozen parsnips hanging in the weather. I’ve got a few poems about lost love myself. This one isn’t really in the style of Ransom. But if I’m reading him right, we have shared some common experiences.